What GROWTH STRATEGY do you need the MOST help with? Want more qualified people visiting your website? We do the hard work to drive more traffic so that you can get more qualified leads and people making purchases from your site. Want more qualified leads? We use our elite traffic techniques and simple conversion methods which together guarantee that your business always has a steady flow of leads. Are you are looking for explosive growth? Work with us and we will turbo-charge your online sales by using little known proven solutions for unstoppable results. What if you had a reliable way to grow your business? $100,000 in new sales: You Bet! 1,000,000 visitors to your website: Absolutely. Contrary to what you may think, the secret to making digital marketing work for your business is a lot simpler than you think. My name is Mical Johnson and I am the founder of Omen Interactive. I get a lot of questions on how to do wonders with a small budget. Too many business owners I talk to think that there is some magic bullet out there or something that they are not doing that is causing them to miss out on new customers and is keeping them from getting paid for their business. They think that running around doing all the latest and greatest new tricks or tips will work. From my experience, it’s something completely different. As a kid my family would watch different Christmas specials every year and one of our favorites was the Radio City Music Hall’s show featuring The Rockettes. The singing and dancing in perfect time and unison made the show captivating to watch, but what if there was only one woman on stage doing the show? Would it still be the same experience? What about 5 women? Would the show still be as impressive? But when you add all 36 women on stage you really get something that is spectacular! Often times for a few of the businesses there are only a few tweaks that need to happen to make things better. The truth is, in most of the businesses I talk to it’s the scale at which they do things that makes their results truly unimpressive. The real problem is that their business doesn’t have a scalable solution for driving traffic, generating leads online, or making more sales online. The crimes we commit against our own business are killing us. No, not real crimes but the things we do or don’t do in our business that rob money from us every single day. Namely, repeatable and scalable solutions. They aren’t complicated, but they are hard to figure out. At Omen Interactive we have spent over 3,840+ hours researching, testing, and implementing digital marketing strategies and we only use the most effective ones with our clients. Step1: We research and test digital strategies. 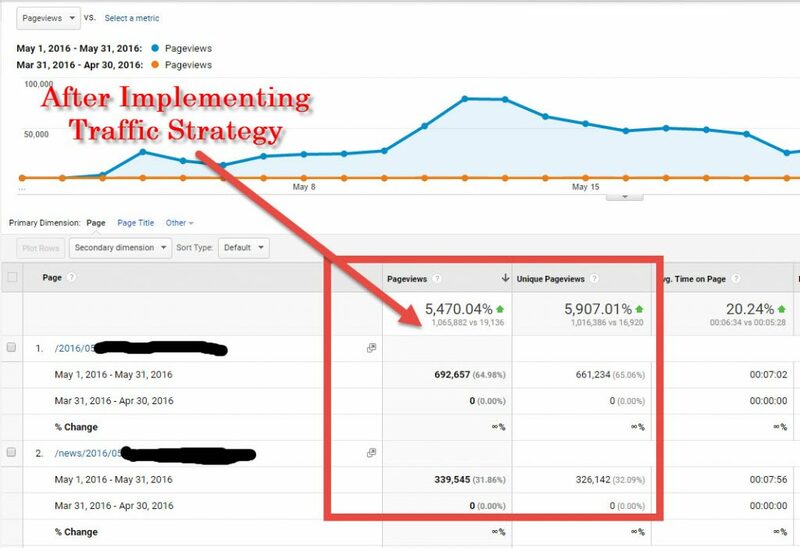 We used a promotional traffic strategy that generated 1,032,202 pageviews in a single month from one blog post. Our client had to upgrade their server because the traffic strategy worked so well. Does this happen all the time? No, the trick is to set yourself up for the BIG wins so when they happen, the wins happen BIG! The best part? Our client hardly had to do anything. The system isn’t hard or difficult to do. It’s not overly complicated. But if you don’t have a system in place to generate this type of traffic you’ll miss out on the opportunities to do so. That’s why we are here. Our team does all the hard work for you so you can focus on building a better business. Suppose this happened to your business! You probably have little website leaks that are keeping your business poor. We can fix that for you. Fill out a discovery form today and find out what we can do for your business. Are you a SEO Agency? Not really. As a SEO company in Sarasota FL for a number of years we found that limiting what we do for our clients to just SEO wasn’t really serving them. As a former SEO company we capitalize on the expertise we developed in that field for our clients now. Are you a PPC Agency? Not exclusively. As a PPC company in Sarasota FL for a number of years, we found that limiting what we do for our clients to just PPC wasn’t really serving them well. We decided to capitalize on our expertise creating PPC campaigns so we developed unique PPC strategies that we use for our clients. Do you run social media campaigns? Yes. The social media campaigns we run for our clients have specific purposes such as generating more traffic, getting more leads, or increasing sales. Do you manage email marketing campaigns? As part of our comprehensive solution we may also utilize email marketing to generate specific outcome for our client. This is determined by their business goals and what they are hiring us to accomplish. Please fill out the discovery form to see if we would be a good fit for you and your business. Do you work with my type of business? Every business and every niche is a bit different. We have specific strategies that we use depending on your business needs. Please fill out the discovery form so that you can see if your business is a good fit to work with us and we with you.